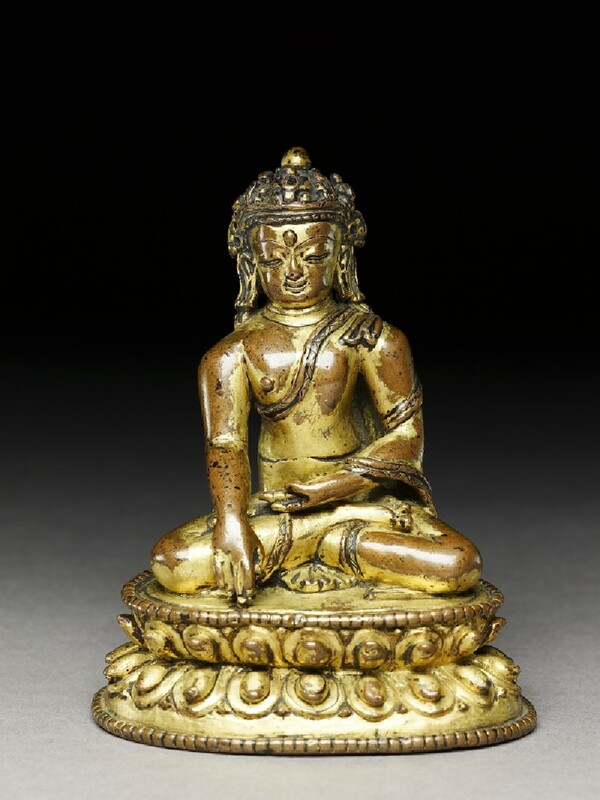 This diminutive crowned Buddha from Nepal is extremely pleasing to the eye due to his peaceful demeanour and harmonious proportions, enhanced by subtle modelling. It has evidently been much cherished, from the loss of gilding where it has been rubbed by the faithful, leaving the reddish-gold copper alloy visible. The Buddha is crowned as universal sovereign presenting his hands in the earth-touching position, recalling the moment when he triumphed over the taunting demons of Mara. The expression is one of peaceful contentment, a slight smile gracing the small lips. The urna is a raised bead set between the thin arched eyebrows. The curls have minute raised spikes at the back of the head, though around the dome ushnisha with jewel finial the curls are modelled as spherical beads. The crown is set into the hair rather than separated from it. There are two lateral fans, then five leaf elements which are curved back over the hair. There is a plain band and a row of beads over the broad forehead. The hairline extends to the ears, which are without earrings but have long narrow holes as if earrings were to be suspended . It is the small draperies from the crown which hang as ribbons behind the ears. The prominent urna, whether cast in relief or a jewel such as an inset turquoise, is one of several stylistic elements which suggest a provenance from the Khasa kingdom in western Nepal. Rather than the downward cast of the head often seen in Kathmandu valley sculptures, here the squarish head is set straight on the short neck. The robe has a rice-grain pattern on two hems, with a thin fishtail fold over the right shoulder. There is an edge of fabric in mid-arm which is anomalous to the garment. This extra fold of robe at the elbow is frequent in Buddha images found in Dolpo, which appear to blend western Tibetan and Khasa kingdom stylistic elements . The robe has a wide sleeve to the wrist, and again the rice grain edging is apparent. Behind the left shoulder, the fabric is folded to make a square, as is characteristic of Khasa Buddhas . The shoulders and torso are very strong and rather massive, but the wrists are more slender. The whole torso in fact is turned very slightly forward to the right, following the extension of the right arm to touch the ground. This is an extremely naturalistic position. The hands have long fingers, whose articulations are not marked in the extended right hand, but the fingernails are visible. The thumb is slightly bent. In the left hand, again the thumb is bent, but here the articulations and fingernails are carefully delineated, as is characteristic of Khasa sculptures . The pedestal has been incised to imitate beading along the upper edge, then comes a double layer of lotus petals, and again beading on lower edge. The beaded pedestal reflects Pala influences in Khasa sculpture, although in India the beaded edge was formed by a row of individually modelled spheres rather than being incised. Also contrary to the Indian prototypes, which are generally carefully finished in the back, here the lotus petals stop completely in the central section of the back, although the body of the statue is modelled and polished. The statue is sealed and appears to have never been opened. 1 This is typical of the Buddha images commissioned by the Khasa Malla patrons. See introductory essay above, and Heller, Hidden Treasures of the Himalaya (forthcoming). 2 Alsop, ‘Metal sculpture from the Khasa Malla kingdom’, and Heller, op. cit. 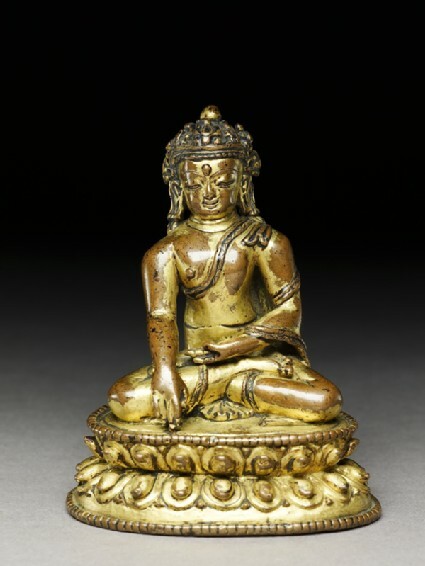 3 See the gilt copper sculpture of Sakyamuni Buddha, attributed to twelfth-century Nepal (illus. Hagmüller, Patan Museum, p. 95), with rice grain pattern and similar manner of draping.